How to record and replay an iMacros macro for web automation. These videos are designed for an office environment, and thus have no sound. Make iMacros fill in a web form to get up-to-date information on a certain flight connection. Have iMacros download the latest map of pollen concentration in the US. Use the built-in editor for more convenient testing/fixing. Using [DS], you can automate AJAX. For example, move elements around with Drag 'n Drop. How to fill a web form from a CSV input file. 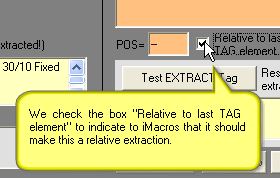 Note: The macros displayed in the tutorials make use of the deprecated EXTRACT command, which now is a simple TAG with the EXTRACT parameter (cf. EXTRACT). When using the Extraction Wizard, recent releases of iMacros will automatically create the new commands (and not the ones that are shown in the tutorial). This page was last modified on 20 November 2018, at 15:30.